Very often, specialized companies create assistive technology with little input from actual users with disabilities. These products are usually institutional in look and feel, overpriced, and only reimbursable by insurance. Logo by Wanda Katja Liebermann. 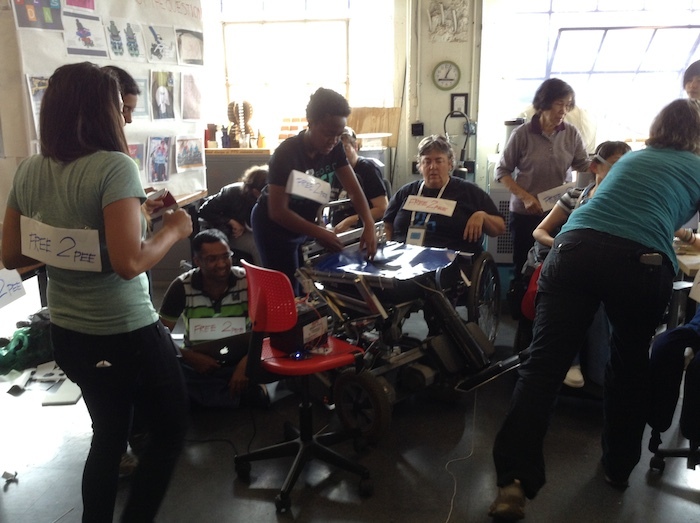 Google.org, United Cerebral Palsy of the North Bay, and Tikkun Olam Makers (TOM) held a makeathon in the SF Bay Area this past September focused on assistive technology for people with disabilities. Each team included people with disabilities, “need knowers,” (i.e., people who need the technology and can share their user experience), and other makers with various technical skills and interests. 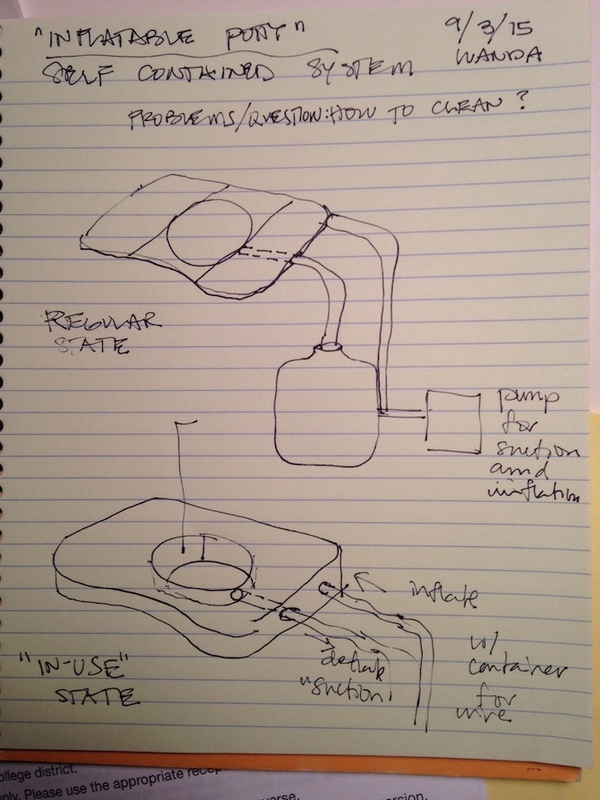 I followed the progress of Team Free To Pee: a project that will assist women in wheelchairs to pee without assistance. Below are excerpts from interviews* with several members of this team about their preparations and experiences pre-makeathon. This is the first of a 2-part article that features interviews with the team before and after the event. Very often, specialized companies create assistive technology with little input from actual users with disabilities. These products are usually institutional in look and feel, overpriced, and only reimbursable by insurance. 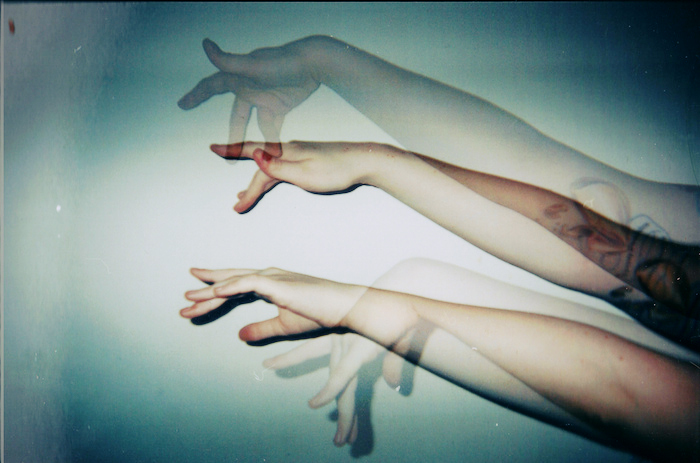 People with disabilities have limited selection and cannot repair or replace parts independently. Upending this relationship between manufacturers and people with disabilities, makeathons and other similar activities can incrementally disrupt this power dynamic. Corbett Joan OToole: I submitted the original idea for Team Free To Pee. I am a scholar and activist involved in the Disability Rights Movement in the Berkeley-San Francisco area. I recently published my first book, Fading Scars: My Queer Disability History. 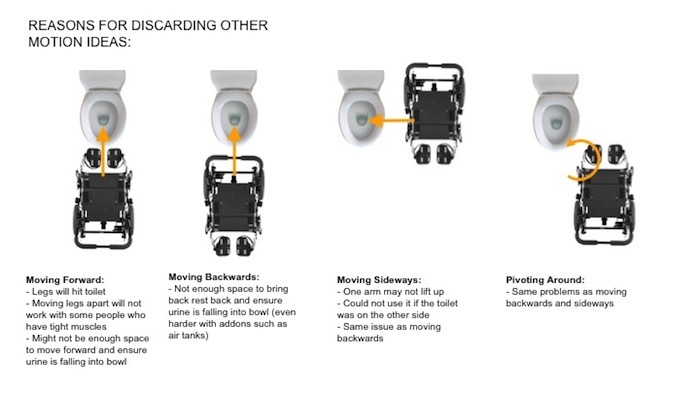 Grace Lin: I am a vent-dependent wheelchair user and a potential user of the Free2Pee design. I am an artist currently working in ceramics. Carol Maddox: I’m a pediatric occupational therapist with an interest in assistive tech, durable medical equipment, and seating. Nidhi Rathi: I’m a mechanical engineer and I’m a designer/maker on this team. I have a mechanical engineering background and I design consumer electronics at work. I know how to machine stuff. Wanda Katja Liebermann: I’m an architect and scholar of disability and design. On the Free To Pee project I saw myself as an observer, critic, and occasional contributor. Corbett: I kept hearing disabled women who for decades have complained about how wheelchairs are designed to allow most disabled men to pee without leaving their wheelchair but that disabled women are stuck without any good options. And I wanted to focus on a problem that, if we are successful in a design, that people could take our ideas and build one on their own. I did not want to create something that would be expensive for disabled people to purchase. I want to create some physical access that will provide at least one peeing option. Of course you could just design a wheelchair from scratch and we did discuss this but a more financially accessible option is to create something that works with existing power wheelchairs. Corbett: For disabled women who cannot pee independently, they often have their lives curtailed. They have few options – mostly they are encouraged to have a medical intervention – usually either a suprapubic or indwelling Foley catheter. Long-term research shows that after 20 years of indwelling catheters, a very high percentage of users develop bladder cancer. I wanted women to have better options. Grace: Not all wheelchair users are incontinent. What appalls me is how doctors or occupational therapists suggest wheelchair users use catheters as a solution rather than looking for other options. Once disabled people can go to the restroom unassisted, it makes the disabled more independent. Many persons with disabilities can’t go to work because they need assistance to use the toilet. Many are stuck at home without a social life for the same reason. Nidhi: Urinating is a basic human need and no one’s freedom should be limited by this. It’s a problem that can be solved and should be solved. Wanda: I was attracted to a number of things about the project. It’s a really gendered issue. For that and its “earthy” nature, male engineers and designers have likely ignored it. It just seemed something that needed addressing, as an issue of justice. After attending the kick-off meeting at Google in SF, I also realized that I was interested in it from a cultural critical perspective: the “maker” culture, SF techno-utopianism, disability activism, and “assistive technology” colliding. Carol: I think users should be the driving force behind this process. This should be a no-brainer…you need to listen to the people who are going to use the equipment if you want the equipment to really meet the needs of the users. The fact that our need knowers were at the kick-off meeting [several weeks before the makeathon] so that they could take the lead right from the start was useful. Corbett: We have a great team with really diverse members. Three of us are power chair users – two of whom cannot pee independently. We have two people with decades of knowledge about how wheelchairs work and deep technical knowledge about wheelchairs and wheelchair seating and we have builder/designer/engineers who are new to disability. Many of our discussions are really fruitful since our Google employee members are encountering these questions for the first time, so they ask really interesting questions. Wanda: Of course, it’s vital to have people with disabilities involved in the design process. I don’t think engaging disabled people in design is that hard; the problem is that the effort is rarely made. Image by Wanda Katja Liebermann. 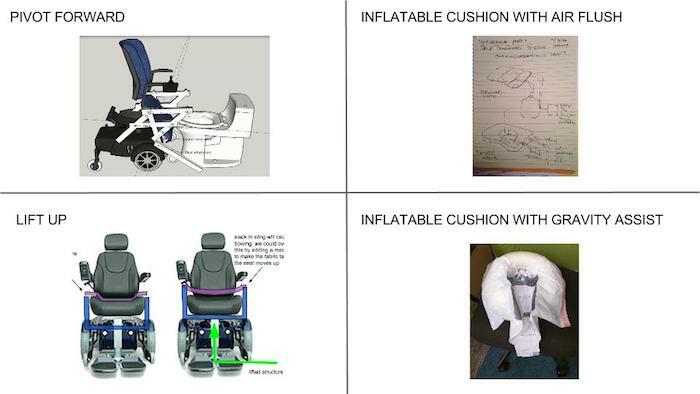 Nidhi: Half the makers made prototypes of the inflatable cushion idea and the other half worked on prototypes of the pivot idea. Rich [team member] has been hacking together the mechanism to prove it out. 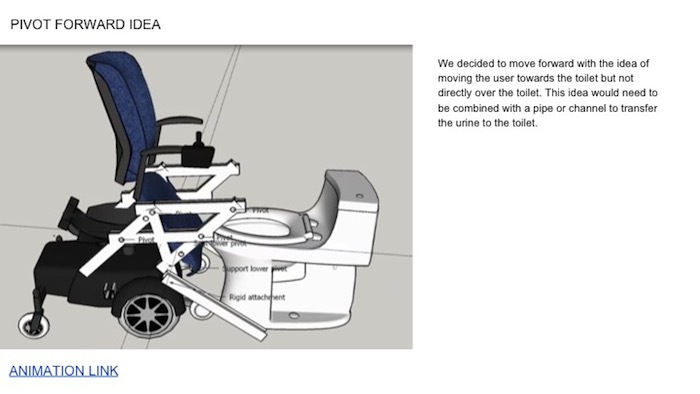 Grace: We designed a pivot-raised sling seat to raise the wheelchair user and a “pee channel” is positioned under the seat with a hose that can reach the toilet. The user has the option of using a disposable bag to collect the waste and toss it away if there is no wheelchair-accessible toilet available. Nidhi: One question is how to allow a wide variety of users to urinate in public bathrooms? 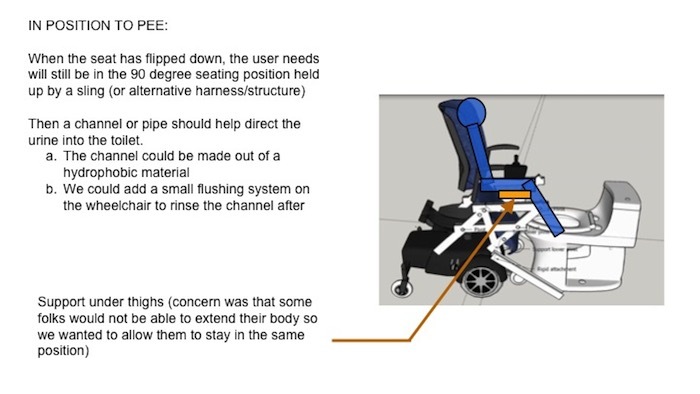 Some major hurdles have been how to limit how much we modify the wheelchair, keep costs low (avoid using consumables) and keep the person secure assuming they have limited torso stability. The biggest challenge is assuming the user can only use their hands to press buttons/move joysticks. We can’t expect them to carry, place or remove anything- that killed a lot of ideas. Grace: There are so many aspects we had to consider. For example: How do we prevent the user from sitting on wet material? Is it safe and comfortable for the user to sit on it all day long? How do we keep the user safe and balanced while raised? How do we keep the design compact enough so the wheelchair can go through doors? 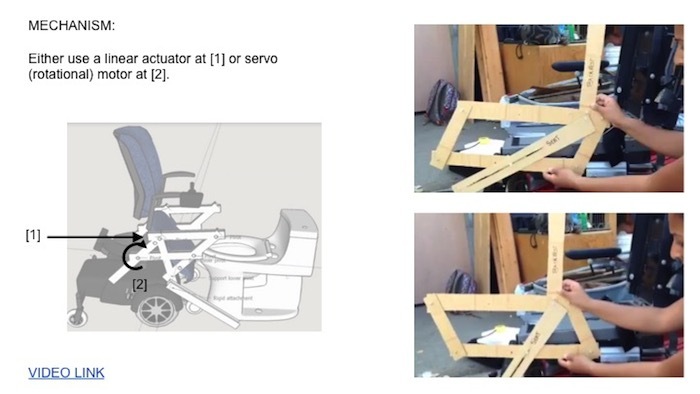 There were also many mechanical questions on creating the pivot, making the motor work and how to connect it to the wheelchair user’s joystick. Nidhi: [During the meetings] we spent 1-2 hours discussing the ideas, pointing out flaws and discussing modifications. At the end we go around and take a vote on what seems most promising, along with why we chose/didn’t choose the ideas. Corbett: I wanted to work with a team where we throw out different ideas – and we make our thinking process available to anyone who wants it. 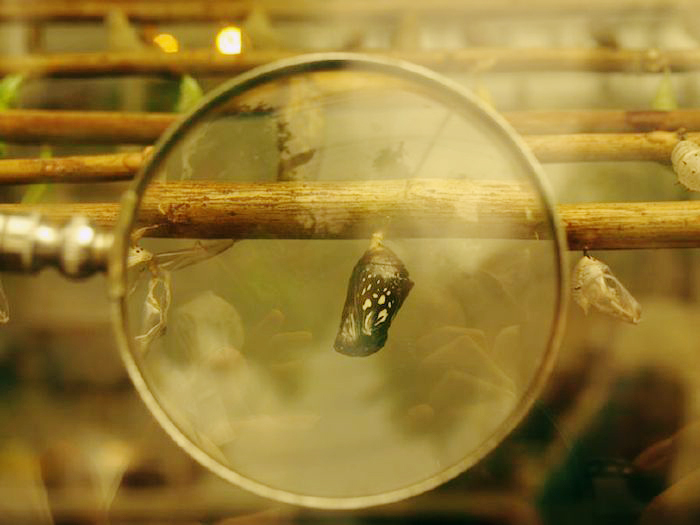 And equally important is to provide documentation of our ideas – the successes and failures – and our process. I love the camaraderie and joy that we all have working on this. The non-disabled engineers are completely new to disability so they ask a lot of interesting questions. The disabled members try to answer them and point out the real-life workings of power wheelchairs and users. I am the most surprised by how much time people are putting into the project. All the nondisabled people work full time and they are doing this work on top of their jobs. And the disabled people already had full lives so carving out the time and energy for this project is challenging. This makeathon is part of a growing movement. The proliferation of DIY culture, crowdsourcing, affordability of 3-D printers (and other tech), and the availability of open-source software and design, allow all kinds of people to engage in the design and manufacturing of products for the first time. The technology that exists to help my body — and the bodies of others — to function, is increasingly more diverse with every year that passes… the overriding thought is that accessible technology allows PWDs not only to have “easier” lives, but more fulfilling ones. The need for intuitively designed technology for people with disabilities is real, and this movement can shape the future of products for all consumers, not just people with disabilities. To see what Team Free To Pee built during the 72-hour makeathon, check out Part 2 of this article. *Interviews have been condensed and edited for space and clarity. **Team Free to Pee members: Rich Arp, Tara Ayres, Sascha Bittner, Wanda Katja Liebermann, Grace Lin, Carol Maddox, Maya Odei, Corbett Joan OToole, Amita Pawar, Anurupa Rao, Nidhi Rathi, and Harish V.